This article is 438 days old. 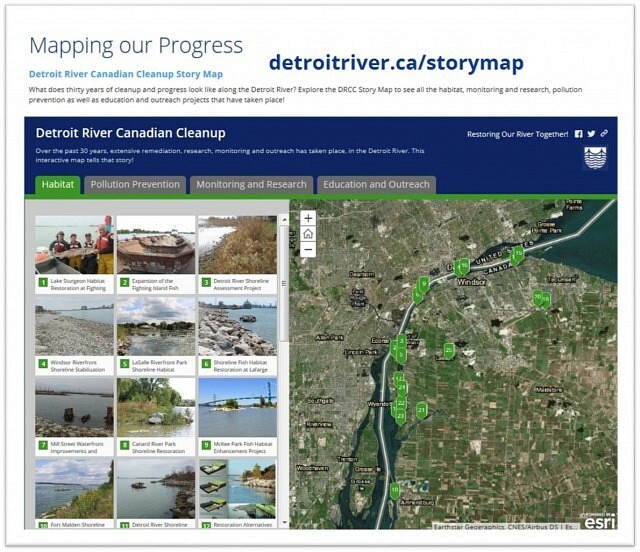 A new interactive mapping tool that tells the cleanup story of the Detroit River has been launched by the Detroit River Canadian Cleanup. Remediation efforts on the Canadian side in the Detroit River include sediment cleanup, habitat restoration, municipal and industrial wastewater treatment infrastructure upgrades, non-point source pollution management as well as a suite of ongoing studies, investigations, monitoring, research, education and outreach. The story map highlights the projects that have taken place over the past thirty since the river was designated as an Area of Concern under the Great Lakes Water Quality Agreement. To explore the Detroit River Canadian Cleanup’s Story Map visit www.detroitriver.ca/storymap.